Referee Neal Brizan made it out of the Hasely Crawford Stadium in one piece last night; but only just. And, if Brizan escaped physical harm, his earbells were surely ringing after his late call helped Central FC salvage a 1-1 draw from the penalty spot against North East Stars in Port of Spain. Photo: North East Stars midfielder Keith Simpson (right) tries to swap shirts with Central FC forward Dwight Quintero. 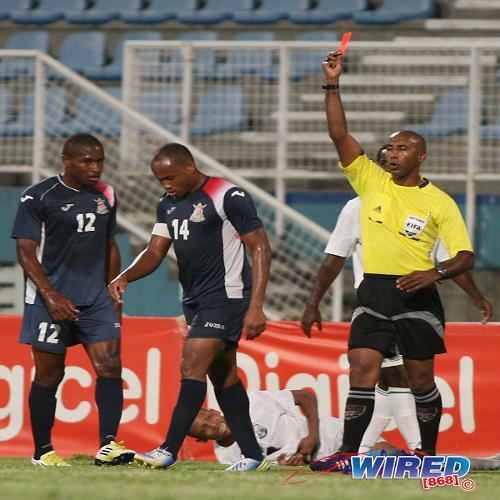 “I thought the referee was shocking,” Central coach Terry Fenwick told Wired868. 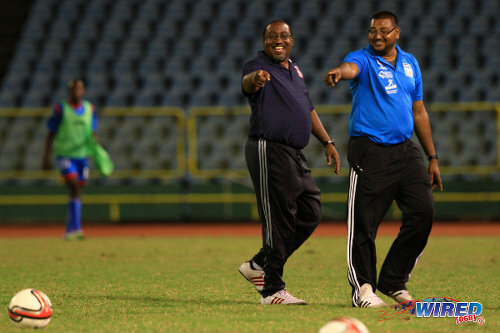 It might be the first time that Fenwick and Eve, who were head coach and assistant coach respectively at San Juan Jabloteh, agreed on anything in the last five years. Earlier, in the Port of Spain double header, Caledonia AIA predictably had a more straightforward evening as the “Eastern Stallions” cruised to a 3-0 win over St Ann’s Rangers. 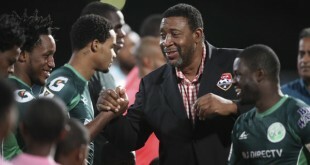 Since Rangers chairman Richard Fakoory waved goodbye to experienced players like Conrad Smith, Keron Cummings and Dwane James in the January transfer window and started raided Port of Spain schools for replacements, the club has gone five games without scoring while conceding 10 times. Photo: Nineteen year old St Ann’s Rangers midfielder Jemel Berot (left) tries to keep the ball from Caledonia AIA defender Marcus Ambrose. Rangers used five players even younger than Beroy yesterday including three 17-year-olds. At this rate, it might be a matter of time before someone calls the child abuse hotline. Yesterday, United States import Ralph Lundy Jr was the one to get his belt out with two goals and an assist for his Grenadian strike partner Kenron Frederick as Caledonia stormed to a three-goal lead within the first 33 minutes. The result pushed Caledonia into third place and three points behind Point Fortin Civic who downed San Juan Jabloteh 2-0 today thanks to a Marcus Joseph double at the Mahaica Oval. Civic has played one game more than Caledonia. Caledonia is now two points ahead of Stars and four ahead of Central although the latter two clubs both have a game in hand. 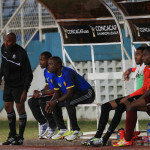 Central FC managing director and former 2006 World Cup defender Brent Sancho must have hoped for top draw football when he pushed through the signings of Ataullah Guerra, Jan-Michael Williams, Willis Plaza, Leston Paul, Jamal Jack, Elton John, Sean De Silva and Dwight Quintero this season. But this probably was not what he had in mind. Last night was the fifth successive draw for the “Couva Sharks” who have managed just nine points from a possible 27 in their last nine games. Photo: Caledonia head coach Jamaal Shabazz (left) and assistant coach Rajesh Latchoo enjoy a good day at the office. The mood has not been as good in the Central FC camp. 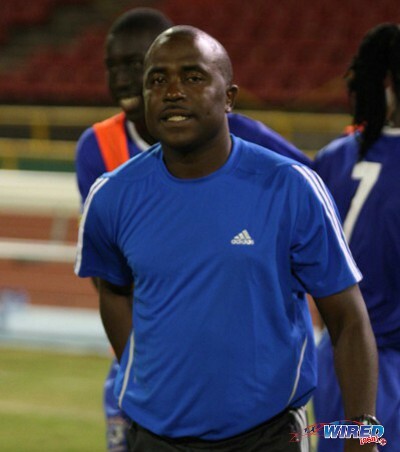 Fenwick criticised penalties given against his team in clashes with Jabloteh and Civic. But, last night, it was Central’s turn to benefit from a debatable decision. Two minutes into stoppage time, Central substitute Rundell Winchester crumbled theatrically to the ground as Stars’ makeshift right back Elijah Manners put an arm across him. 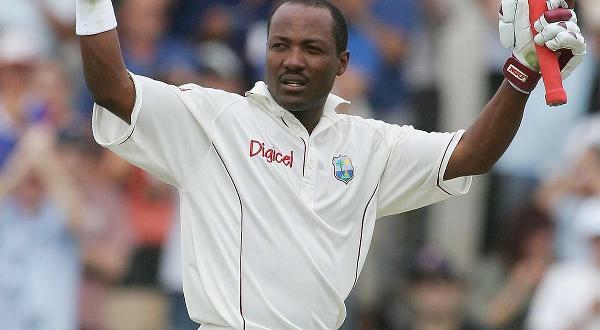 And veteran 38-year-old Central captain Marvin Oliver converted the penalty to bring both teams square at the death. 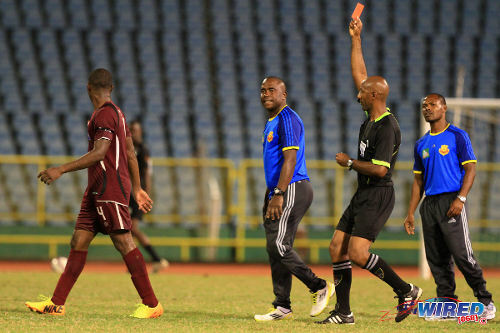 Brizan ejected Eve and another technical staff member for their uncharitable sentiments while, after the final whistle, there was a red card for Stars’ animated Jamaican midfield Keithy Simpson too. More serious, arguably, was the response from the Stars owner, Mahabir, who stormed on to the field to confront Brizan after the final whistle and the non-existent security for the officials. It was easy to forget that there was an intriguing, if not exciting, contest for the 90 minute stretch that preceded Oliver’s penalty. In the four prior league meetings between Fenwick’s Central and Eve’s Stars, there was one win apiece and two ties between them. Yesterday’s result was every bit as edgy. Eve suggested that Central’s line-up, which moved from 3-5-3 to 5-3-2 whenever Stars got possession, flattered his lone striker, Trevin Caesar. The first 44 minutes was standard fare between the two clubs; tight and spiky with no goalmouth action but a string of crunching tackles. 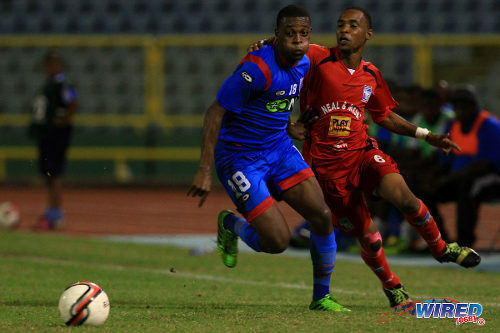 Oliver and Akeem Benjamin were booked for Central as was Stars midfielder Jeromie Williams. Seventeen year old Arima North Secondary schoolboy Jesus Perez, who has impressed at left back with composed, solid defensive work, got into Brizan’s notebook too with some style as he caught Jamal Jack with a lunge that sent the fearsome Central defender four feet into the air. It was Simpson who set the game alight though with a brilliant, backheeled flick into the far corner, seconds before the halftime interval, off a Kennedy Hinkson set piece. It was potentially a telling strike. 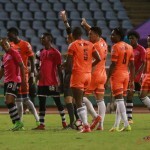 The Sangre Grande-based team has not conceded a goal or dropped a point after scoring first, since a 2-2 draw against Police FC on 16 March 2013. 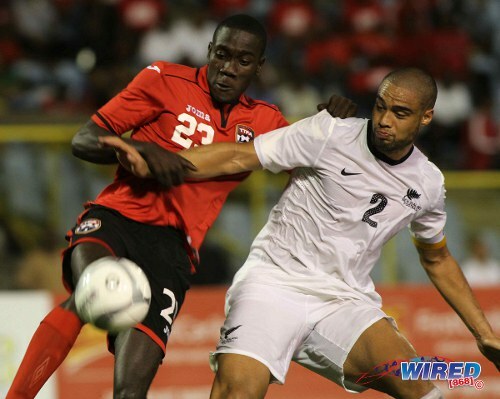 Photo: Former Trinidad and Tobago stand out Angus Eve has made North East Stars into an almost unpenetrable force. Fenwick replaced a defender, Benjamin, with winger Johan Peltier for the start of the second half and the offensive move did make things more difficult for Stars. Plaza popped a header wide at the far post off a Jason Marcano cross in the 56th minute. And Central went even closer, four minutes later, as Peltier flicked on another Marcano cross and Quintero flung himself at the ball to steer it towards goal. 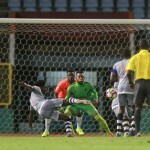 But 20-year-old goalkeeper Stefan Berkeley, who made his league debut in place of injured team captain Cleon John, somehow recovered to claw the ball away from the goalmouth. Central players pleaded, unsuccessfully, that Quintero’s effort crossed the line. At the other end, Caesar spun Elton John to finally break clear of the opposing defence in the 67th minute but then sent his shot wide of the far corner. Simpson could have doubled Stars’ lead too after being released by Cummings in the 76th minute but could not get his angled effort past Central goalkeeper Jan-Michael Williams. Twenty year old attacker Rundell Winchester was brilliant for most of 2013, since he joined Central from Stokely Vale. But his form has dipped so dramatically over the past three months that Fenwick initially left him out of the team altogether last night. 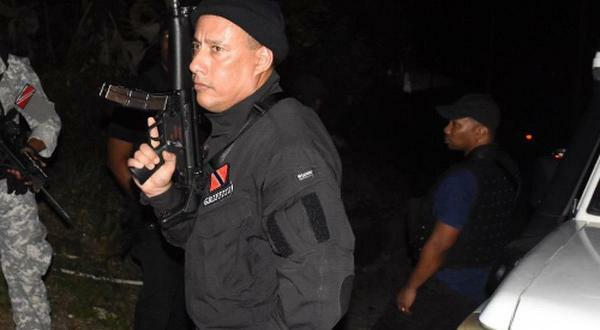 But Winchester’s replacement, 16-year-old Naparima College student, Nicholas Dillon, got stuck in traffic on his commute from San Fernando to Port of Spain. And, as Central struggled to find an equaliser, Fenwick sent Winchester on for Quintero. And the Tobagonian won the controversial penalty sent the stadium into uproar. “We got fortunate with the penalty to get the draw really,” said the Central coach. 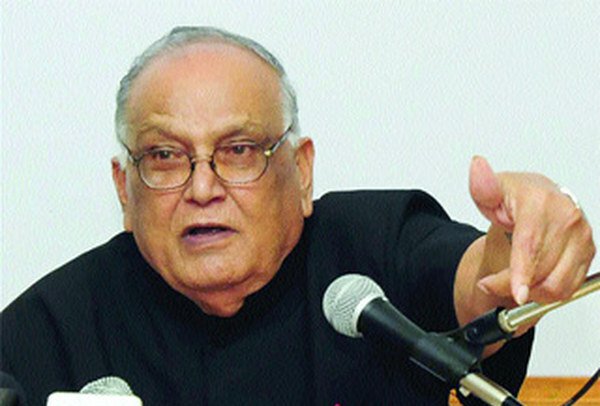 “I thought it was dubious although I was too far away to be sure. The post-mortem of last night’s clash should be very interesting. Not least because Pro League CEO Dexter Skeene surely has to make an awkward phone call to Mahabir. Eve insisted that his colleagues should not be the only ones before the disciplinary committee. “The referees are never held accountable,” said Eve. “I might have to answer charges but not the referee. He will just send in his report for them to read and won’t even need to be present. Photo: Referee Neal Brizan (right) flashes red at Defence Force captain Cory Rivers (centre) during a Pro League match last season. 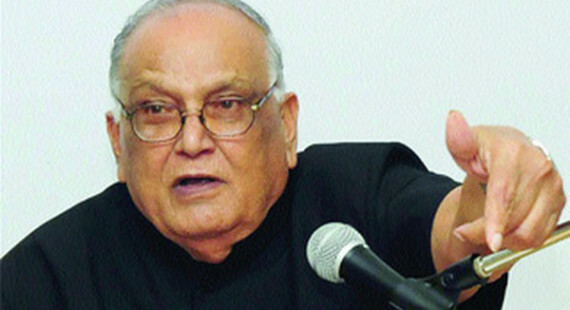 Brizan is widely regarded as one of the country’s finest officials but he was fiercely criticised last night. For now, the Stars team moves one spot up to fourth on the back of yesterday’s point and has a game in hand over the second and third place teams. One suspects the Pro League’s disciplinary committee will have the final word, though. North East Stars (4-2-3-1): 1.Stefan Berkeley (GK); 7.Elijah Manners, 5.Aquil Selby, 19.Glenton Wolfe (captain), 48.Jesus Perez; 6.Jeromie Williams 12.Jayson Joseph; 23.Kennedy Hinkson (11.Lemuel Lyons 82), 4.Keithy Simpson, 8.Keron Cummings; 20.Trevin Caesar (41.Neveal Hackshaw 85). Unused substitutes: 22.Cleon John, 9.Akiel Guevara, 15.Chike Sullivan, 16.Franz Husbands, 18.Kaashif Thomas. Central (3-4-1-2): 21.Jan-Michael Williams (GK); 2.Elton John, 50.Yohance Marshall, 24.Akeem Benjamin (13.Johan Peltier 46); 12.Jamal Jack, 6.Leston Paul, 10.Marvin Oliver (captain), 27.Samuel Delice; 7.Jason Marcano; 9.Dwight Quintero (17.Rundell Winchester), 1.Willis Plaza (22.Keon Trim). Unused substitutes: 25.Javon Sample (GK), 4.Sean De Silva, 11.Darren Mitchell, 18.Kevon Goddard. Previous Stop playing with those soldiers, Griffith!